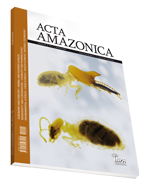 Acta Amzonica is a multidisciplinary, peer-reviewed, open access, free-of-charge scientific journal for research in and about the Amazon region, published since 1971 by the Instituto Nacional de Pesquisas da Amazônia - INPA, in Brazil. The journal publishes quarterly issues containing articles and short communications in English across a broad range of disciplines, including Agronomy and Forestry, Animal Sciences and Fisheries, Biodiversity and Conservation, Biotechnology, Chemistry and Pharmacology, Environmental Sciences, Food Sciences, Geosciences, Health Sciences, Human and Social Sciences, and Materials Technology. Acta Amazonica is a member of SciELO Brasil since 2009.